What is Collaborative Whale-Watching and Wildlife Viewing? 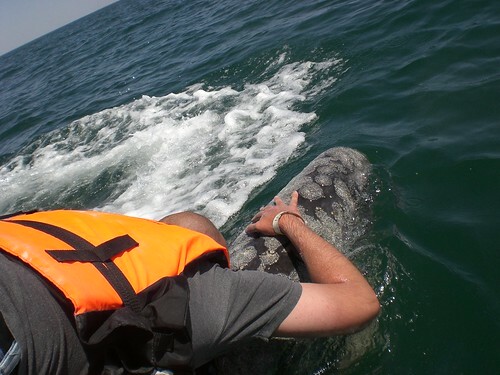 Photo of man hugging gray whale in San Ignacio Bay courtesy of Marc Uhlig of Jupiter Labs. Biologist Toni Frohoff has a new way see whales and other wildlife: collaborative watching. That’s right: she wants us to work with whales so we all get something out of the experience. Instead of just being stalkers, we’d interact on mutually agreeable terms. What Frohoff, research director at TerraMar Research and the Trans-Species Institute of Learning, is proposing is an overhaul of eco-tourism standards. She wants the whales (and other animals) to be in on it, to collaborate with the humans that want to watch them. Sound impossible? Well, she does it all the time with gray whales in Baja California. As a behavioral biologist she made an appearance in the much-discussed New York Times Magazine story Watching Whales Watching Us. The gray whales migrate up and down the west coast, seemingly indifferent to humans, but once they reach their nursery harbors off Baja, they suddenly become curious about people. That’s even more remarkable since people once slaughtered whales here–so much so the species was almost wiped out. But now they’ve realized people–or at least the people in these harbors–aren’t throwing harpoons, they are offering hugs. Photo of whale near row boat courtesy of FarFlungPhotos and Tarnya Hall. What do the whales get out of it? For reasons no one can explain, they seem really into it, coming up to boats curiously and seeking out interaction, not just tolerating it. What the whales can’t see is the more important big picture of what the whale watchers are bringing them: peace, security and respect. The whale-watching industry is now a $2.1 billion industry worldwide. No one is sure exactly how big the rogue whale-hunting industry is, but we do know whale meat prices have sagged and the governments of Norway, Japan and Iceland have to effectively put their on welfare. The World Wildlife Foundation estimates that Japan spends $12 million a year propping up whaling; while Norway spends $500,000 to support an anemic $2 million industry. I think eco tourists would love the idea of collaborative whale watching. Of course we want the fascination to be mutual and fair; that’s human nature. I think people naturally want to give something in return if someone offers them something nice. People leave out food for birds and animals mainly for practical reasons of drawing them in close. But part of us also wants to be nice–or at least appear nice–to them. We are, in effect, paying the cardinals to show up at our feeder by putting out sunflower seeds. Will other animals start to collaborate with us? Sure would be nice. I’ve had a sunfish focus his big, ghastly eye on me; squirrels look at me and bark until I figured out they were standing above a cat they wanted me to chase away; deer stare into a window at me staring at them. Of course, for every one of these delights, I’ve had 100 or 1,000 experiences of an animal fleeing, fearing that I’m hunting them. That is wildlife watching in the early 21st Century. It wasn’t always this way. And, once we start offering animals something in return–ideally something more abstract than food–maybe we’ll see it again. Want to see some whales yourself? Here’s where you can do it.